Whether it's the sale of a single piece of gear, multiple items, turnkey installations with custom solutions, or equipment training, Triple Audio serves the needs of broadcasters across the Netherlands. 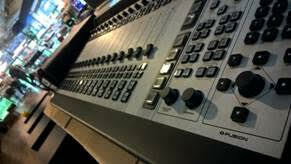 In fact, there isn't much related to broadcast equipment that the company doesn't do. Among that is sales and distribution of gear from The Telos Alliance. Marijn Fluitman, a project engineer, has been with Triple Audio for four years. The company is definitely engineering-driven. There are two managers and twelve employees, all engineers. They step into the administrative, sales and training roles as needed. “We're a bunch of young guys with the drive to do it all,” explains Fluitman. The company began in a basement, and after a couple moves, relocated to a building designed to their specifications. The work space is completely open, meaning there are no walls between the office and shop. “We like this arrangement because it allows for instant communication, and everyone can see the status of a project and know what's going on,” adds Fluitman. The garage at Triple Audio was designed specifically for working on remote broadcast vehicles. It has a free height of 6.20 m (20’) and a length of 28 m (91’, 10”), meaning that work on even the largest trucks can be completed indoors. It's equipped for fast fabrication and turnaround of media and news vehicles as well as measurement and calibration trucks, mobile command centers, and other special task vehicles. Another specialty is the installation of fully automated DC-AC converters to power all the gear in these vehicles. The workshop offers ample space for both warranty and non-warranty repair of broadcast equipment. And while that is going on, there is still plenty of room to pre-assemble and wire up studio cabinetry and racks for systems integration projects. Triple Audio also gives training and courses on a variety of equipment and installations. Their new building offers lots of open space for these activities. The training sessions offer a good balance between theory and practice, plus hands-on demonstrations. The outcome is an increase in the knowledge level of a station's air staff, increasing job satisfaction, efficiency, and preventing mistakes. 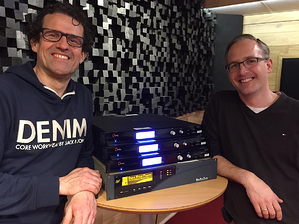 In order to gain some traction in the Dutch broadcast market, Triple Audio sponsors seminars to introduce customers to the concept of AoIP in general, and Telos Alliance gear in particular. There was a lot of Axia, Telos, and Linear Acoustic equipment available for hands-on demonstrations at a recent seminar. A few Telos employees were available for some of the sessions, including Peter Passian, Director of Sales, Eastern Hemisphere, Mary Ann Seidler, Global Director of Processing Sales, Ken Tankel, Platform Manager for TV Processing, Linear Acoustic, and Hans van Zutphen, Senior DSP Engineer. Around 50 people attended the two seminars that were offered. As a systems integrator, many Triple Audio projects involve Telos equipment. In December of last year, Triple Audio installed a new studio for Puur NL, a Dutch broadcaster and a subsidiary of the Regionale Radio Groep. This project entailed building a second live studio using an Axia Fusion AoIP mixing console. Triple Audio's custom work included building special studio furniture which is height adjustable for optimized ergonomics, giving the station a very large and flexible Axia installation. Pathfinder Routing Control software is used to configure a 'Stackevent' and link it to every user button or GPI trigger that the station selects. Omrop Fryslan recently changed the format of their FM station, and began to think it would be a good idea to change the technical end of the sound as well. The existing audio processor had been on line since 2011. In addition to the format change, the station did away with board operators, and now DJs have to do that job themselves. Triple Audio had some suggestions about audio processing. With the format change the station has a mix of dialogues and music, which made it impossible to optimize the processing just for one type of programming. Martin Wijbenga, head programming engineer at Omrop Fryslân says: ''At the FM transmitter sites, the IDT is supported by the new Omnia.9sg. This stereo-encoder / end limiter provides us with the possibility to create the sound for the FM that we had in mind, with a hefty chunk of loudness as well. Because of the smart tools in the end process of the Omnia.9sg, we’re able to create the sound that fits the contemporary sound and loudness on the FM, yet clean and open. This clean and open sound makes it possible to listen to the station for a long time without listener fatigue.